The Head Jog Carbon Clipper Comb is made with a high carbon content which gives it strength and durability as well as making it heat resistant up to 230°C (so it'll survive sterilising with heat). It has strong teeth and a flexible body that aid blending, tapering, flat top cutting and all clipper-over-comb techniques. £2.22 (inc. VAT) Why no VAT? We're a trade wholesaler and quote our prices without VAT to help our VAT-registered customers understand the true cost of a purchase. Strong and lightweight bamboo cutting comb that's been treated to repel water and prevent oil absorption. Designed to be durable and hold its shape, it's also naturally anti-bacterial. 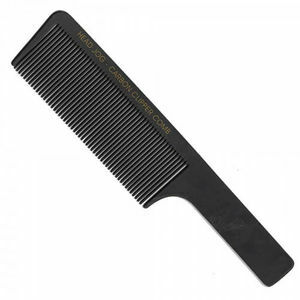 Strong, lightweight and durable carbon fibre barber comb which is heat resistant and static free. Designed specifically for barbers, with both wide- and narrow-spaced sets of teeth. Innovative barber comb (195 mm) featuring an integrated ledge that provides a guide for your scissors or clippers for incredibly precise cutting. Comes in Black, White or Pink.